The heart of a blue whale is about the size of a VW Beetle car and weighs up to 1000 pounds – that’s about as much as 1,111 cans of baked beans!The aorta, a major blood vessel for the heart, is big enough for a human child to crawl through. Blue whales are pregnant for 10-12 months. The newborn calf is about 7.5 m long and weighs about 5.5 – 7.3 tonnes –nearly as much as 100 men! A baby blue whale drinks about 225 litres (about enough to fill a bath) of its mother’s fat-laden milk (it is 40-50% fat and about the consistency of cottage cheese) a day, gaining 3.7 kilograms an hour,until at age 8 months they are 15 m long and 22.5 tonnes! 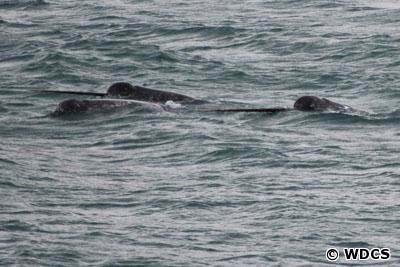 The mother and calf may stay together for a year or longer, until the calf is about 13 m long. 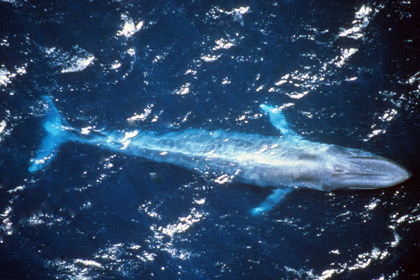 Blue whales reach maturity at 10-15 years. Sperm whales are also champion divers. Adults can stay underwater for almost two hours and dive to depths of 2,000 metres, maybe more! They eat squid, which can live very deep in the ocean, so sperm whales have to dive down into the deepest parts of the sea to catch them. No one is quite sure how they make such deep dives. The sperm whale’s huge head, which is up to a third of its overall body length, houses the heaviest brain in the animal kingdom - up to 9kg. The head also consists of a cavity large enough to park a car inside that contains a yellowish wax called spermaceti. The bowhead whale, which lives exclusively in the Arctic, has the thickest blubber of all cetaceans. It can reach a whopping 70cm in thickness. These whales also have the longest baleen – the comb-like structures hanging down from their upper jaws used as a sieve to filter food from the sea-water. These baleen plates can reach up to 5 metres in length – taller than a double-decker bus! 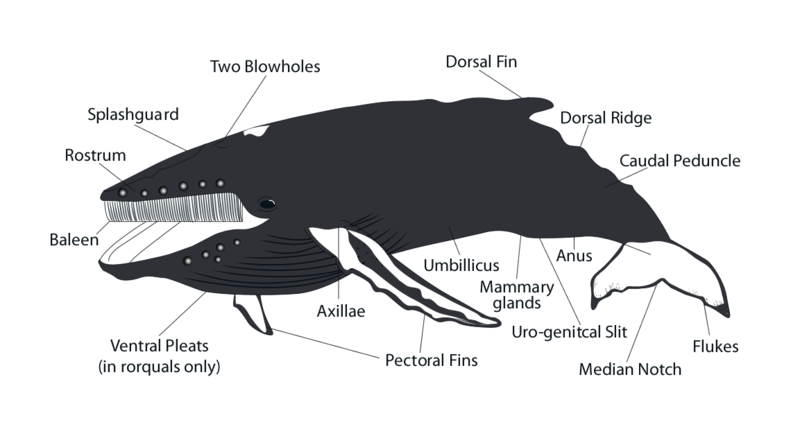 The southern right whale has the largest testes in the animal kingdom –each pair weighing around a tonne. That’s the same as 1,000 bags ofsugar! The male narwhal has two teeth. The left one pierces the animal’s lip and grows to an incredible 2-3 metres. In Europe, these tusks were once sold as the horns of the mythical unicorn. An individual fin whale pees about 970 litres per day. That’s enough to fill up more than 3 bathtubs! 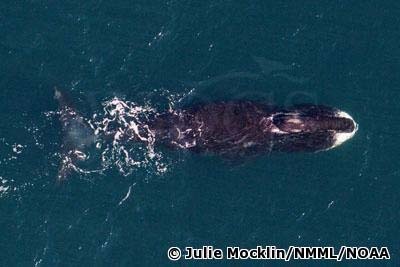 The North Atlantic right whale is one of the most endangered whales. Only around 400-500 individuals survive, living along the east coast of North America. A few hundred right whales also live in the North Pacific while the Western Pacific gray whale may be down to the last 150 whales. In the wild whales live for a long time - generally the larger species living longest. Bowhead whales spend their lives in cold Arctic waters. 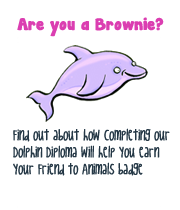 They may be the world’s oldest mammals and are the longest lived of all whales – possibly over 200 years! Beluga whales are called the "canaries of the sea" because they make sounds like the little yellow birds. 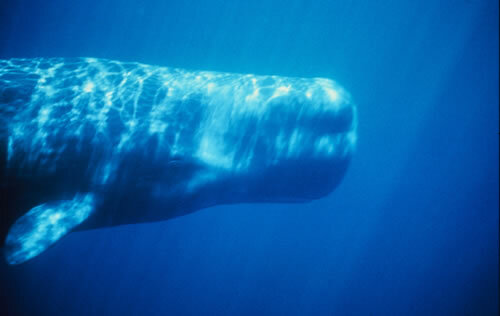 Sperm whales make the loudest sounds. They have been recorded making a noise at 230 decibels. Blue whales are also very loud. Their call reaches levels up to 188 decibels and can be heard hundreds of miles away. A jet in comparison reaches only 140 decibels. Sounds over 120-130 decibels are painful to human ears. Male humpback whales sing the most complex songs and have long, varied, eerie, and beautiful songs that include recognizable sequences of squeaks, grunts, and other sounds. The songs have the largest range of frequencies used by whales, ranging from 20-9,000 Hertz. Only males have been recorded singing. They sing the complex songs only in warm waters, perhaps used for mating purposes. In cold waters, they make rougher sounds, scrapes and groans, perhaps used for locating large masses of krill (the tiny crustaceans that they eat). 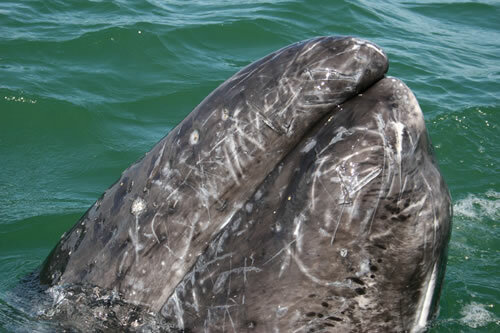 Find out more about why whales sing. 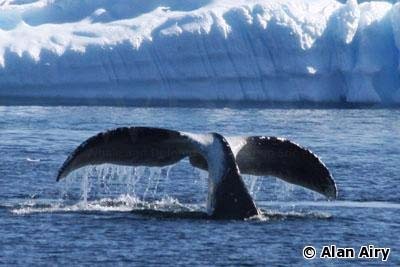 The humpbacks that feed in Antarctic waters and swim north to breed off Colombia and Panama make the longest confirmed migration of any mammal.